If you've been following along with our goals and achievements you will be happy to know our first 3-month computer class has come to an end with 7 graduates. We had our ceremony this morning with 4 board members attending. Our lovely interns, Julia and Daniel we kind enough to make crepes for everyone. None of the Nepali guests knew quite what to do with them, but everyone enjoyed them, for sure. 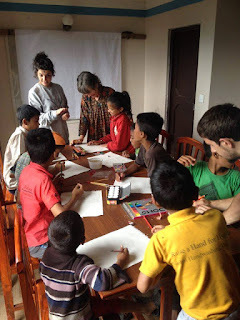 Our little, grassroots agency, Kay Garnay for Nepal, has done many things so far with very little money. We just do whatever we can to help the people. Sometimes that means getting creative. It's difficult to get a job in Nepal, which is actually why I employ 5 local people. They won't get rich on the base salary, but I offer them ways to make more money. Whether they work as a local guide for our guests, bring a tourist to stay at the guest house or help me with a marketing campaign, they can always earn more. This past month my newest helper, Bikash, spoke to a friend with a guest house and sponsored him on our AirBnB affiliate program. Anyone who signs up under us to become a host will get a $50 bonus when they get their first guest that pays $100 or more. If you would like to support Kay Garnay for Nepal this is an easy way. This past year has seen many hardships for Nepali. As if the earthquakes weren't enough, we had 6 months of political issues with India. Due to the border being closed for cooking fuel and petrol, many people had to cook with wood, including us. We've been trying to make up for the deforestation by planting trees and so far we've planted more than 50, thanks to a couple of our donors from UK, Mark and Tom Goddard. Not only did they donate, but they are coming to Nepal to volunteer. So looking forward to hosting them. This is school break for many of the children here in Changunarayan. We have been encouraging them to speak English and give them something to do. The kids are enjoying Daniel and Julia, our interns, who play football with them, staged art classes and even 'Popcorn and a Movie' night. The first movie was "Epic," a children's movie to encourage them to be strong and take back their own power. Again, we have to say thanks to our donors, the Goddards, for the new projector. Speaking of getting creative in order to accomplish something on a budget, our next project is to take 4 of our children's libraries that we've been doing book drives for and create a sharing network. We will begin a book rotation so the kids will get some fresh books. Our tip for coming to Nepal: We wanted to do more during the semester break, but found unexpected resistance from the school's principal. I didn't understand why. It was finally explained. Many well-meaning tourists volunteer with NGOs or start one, but have an agenda to convert the children to Christianity. Not only would the principal loose his job, but the volunteer would likely get deported. Hindus have been living and dying for many generations prior to Abraham walking with God, so all is probably well in that department in Nepal. Conversion from Hinduism or Buddhism is prohibited. I seriously did not know that.